Clonsilla is a busy suburb of Dublin and is located just 2.2km to the south of the Blanchardstown Town Centre and has seen a considerable amount of new commercial and residential development over the past three years with new schools along the Ongar Distribution Road and new residential developments at Diswellstown and Hansfield. There is a strong demand for new homes in this area. This site is very close to St. Mochta’s National School and a short drive to Blanchardstown and Ongar villages. Local retail services are available along Clonsilla Road with a wide range of schools (Luttrellstown Community College and St Mochta’s National School) in the area and an abundance of sports clubs including St Mochta’s Soccer Club, Castleknock GAA Club and Luttrellstown Castle Golf & Country Club. The full range of retail occupiers are available in Blanchardstown Town Centre and include Dunnes Stores, Pennys, M&S, Next, Heatons as well as Woodies, Homestore and More, Omni Leisure Centre and the Draiocht Arts Centre. 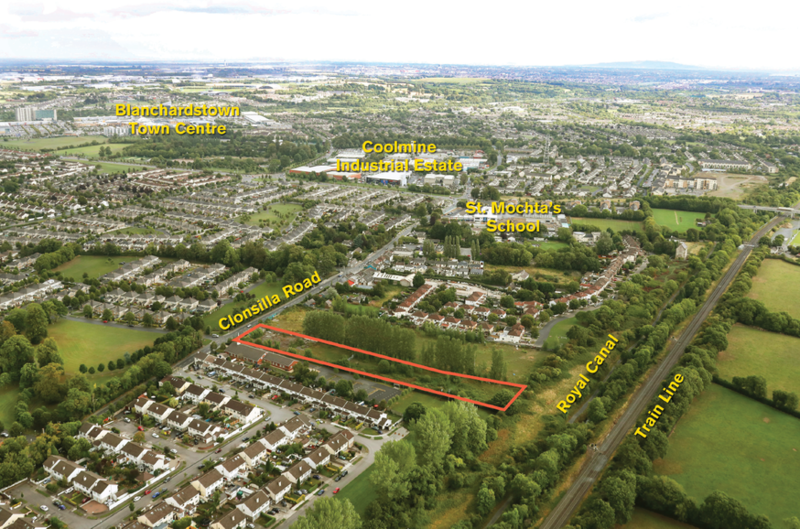 The lands comprises a rectangular shaped site with 29m frontage to Clonsilla Road (R121) and extend to 0.77 hectares (1.9 acres). The property includes two derelict cottages facing on to the Clonsilla Road. The site is mostly level and is bounded by Clonsilla Road to the north, the Church of Jesus Christ of Latter-day Saints to the west, a narrow strip of undeveloped residentially zoned land situated to the south, and an undeveloped site extending to a 1.42 HA (3.51 acres) of further Town Centre zoned land to the east which we understand is in the ownership of Aldi. A portion of the site in sale was previously used for parking vehicles and is set out as a compound with a concrete yard area, two steel gates and an aluminium fence run. The remainder of the site is in grass and is bounded by a row of poplar trees to the east. On the adjoining site, Aldi Stores (Ireland) Limited were refused planning permission by An Bord Pleanala in 2015 for the construction of a mixed use residential and retail scheme comprising a 2 storey commercial block fronting Weaver's Row, incorporating food store measuring 1,740sq m. (Fingal Ref: FW14A/0144). On the adjoining site, to the west, the Church of Latter Day Saints was granted planning permission in 2000 for a new church, with associated car parking and fencing. (Fingal Ref F99A/1396). The property is situated in an area zoned Objective TC - Town and District Centre. Objective: Protect and enhance the special physical and social character of town and district centres and provide and/or improve urban facilities. Vision: Maintain and build on the accessibility, vitality and viability of the existing Urban Centres in the County. Develop and consolidate these Centres with an appropriate mix of commercial, recreational, cultural, leisure and residential uses, and to enhance and develop the urban fabric of these Centres in accordance with the principles of urban design, conservation and sustainable development. Retail provision will be in accordance with the County Retail Strategy, enhance and develop the existing urban fabric, emphasise urban conservation, and ensure priority for public transport, pedestrians and cyclists while minimising the impact of private car based traffic. In order to deliver this vision and to provide a framework for sustainable development, Urban Centre Strategies will be prepared for centres in accordance with the Urban Fingal Chapter objectives. Permissible Uses include: Bed and Breakfast, Betting Office, Carpark - Non-Ancillary, Childcare Facilities, Community Facility Cultural Facility Dancehall/Nightclub, Education Exhibition Centre, Fast Food Outlet/Take-Away, Funeral Home/Mortuary, Garden Centre, Guest House, Health Centre, Health Practitioner, Holiday Home/Apartments, Home-Based Economic Activity, Hospital, Hotel, Office, Ancillary to Permitted Use, Office ≤ 100 sq.m. Office > 100 sq.m. and < 1,000 sq.m. Office ≥ 1,000 sqm, Open Space, Petrol Station, Place of Worship, Public House, Public Transport Station, Recreational Facility/Sports Club, Research and Development, Residential, Residential Care Home/ Retirement Home, Residential Institution, Restaurant/Café, Retail - Local < 150 sq.m. nfa Retail - Convenience ≤ 500 sq.m nfa, Retail - Comparison ≤ 500 sq.m. nfa Retail - Comparison >500 sq.m. nfa27, Retail - Supermarket ≤ 2,500 sq.m. nfa,. Village, Sheltered Accommodation, Taxi Office, Telecommunications Structures, Training Centre, Traveller Community Accommodation, Utility Installations, Vehicle Sales Outlet - Small Vehicles, Vehicle Servicing/Maintenance Garage, Veterinary Clinic. Not Permitted Uses: Abattoir, Aerodrome/Airfield, Agribusiness, Agricultural Buildings, Agri-Tourism, Air Transport Infrastructure, Boarding Kennels, Car Hire Holding Area, Caravan Park – Holiday Caravan Park – Residential Cargo Yards, Civic Waste Facility, Concrete/Asphalt Extractive Industry/Quarrying, Farm Shop, Fuel Depot/Fuel Storage, General Aviation, Golf Course, Heavy Vehicle Park, Industry – General Industry - High Impact, Logistics, Plant Storage, Retail - Hypermarket > 5,000 sq.m. nfa, Road Transport Depot, Warehousing, Waste Disposal and Recovery Facility (Excluding High Impact) Waste Disposal and Recovery.